I read this article and found it very interesting, thought it might be something for you. 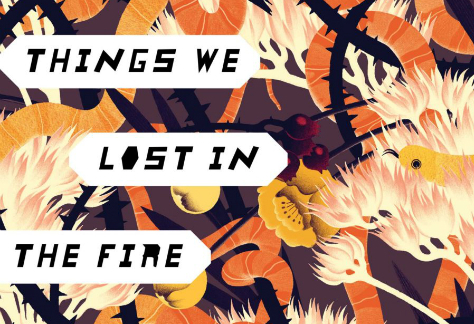 The article is called Book Review: Things We Lost In The Fire – Mariana Enríquez and is located at https://www.totallydublin.ie/more/print/book-review-things-lost-fire/. Fans of magical realism will appreciate Argentine Mariana Enríquez’s latest volume of short stories. Peopled by apparitions, uncertainty, and colourful folk religion, the stories are set against sprawling backdrops of poverty and inequality. Indeed, Enríquez places herself in the tradition of Borges and Cortázar, for whom fantastic themes did not obscure the material reality of Latin American people – in Argentina’s case, two bloody military dictatorships in the second half of the twentieth century, with tens of thousands ‘disappeared’. With Things We Lost in the Fire, the disappearances continue. In ‘The Dirty Kid’, the collection’s hard-hitting first story, a street kid and his newborn sibling vanish; other tales feature children who step off a bus or inside a haunted house and into the unknown. History itself is disappeared: in ‘The Inn’, another strong piece, a man is fired for revealing the violent past use of the inn he works at, a former police academy during the dictatorship. His daughter, enmeshed in the surreal revenge act of inserting raw chorizos into the establishment’s mattresses, is set upon by yelling, thumping spirits – when their brief visit ends, they are discredited with the same vehemence as the erasure of history itself. All that remains is the girl’s fear. However, this volume does more than simply put a supernatural spin on all-too-real history: in exploring the psychic traces of this historical trauma, Enriquez hits upon painfully contemporary themes that will resonate far from the Río de la Plata. The aforementioned piece ‘The Inn’ is as much a ghost story as a queer awakening, in which the sausage vandal’s best friend struggles to identify the feeling in her stomach when her friend touches her, amid taunts of being a ‘lesbo’. Close female friendships are at the heart of many of these stories. The protagonist of ‘The Dirty Kid’ lies in bed parsing neighbourhood gossip with local confidante Lala, a transgender hairdresser. In ‘The Intoxicated Years’, reckless young women swear their commitment to each other ‘with blood, cutting ourselves a little, and with kisses, in the dark because once again there was no power’. Enríquez’s characters are compellingly complex, eschewing essentialist notions of female goodness to reveal women who are disconcerting, off-putting, or fully reprehensible. ‘The Dirty Kid’ features a ‘middle-class woman who thinks she’s a rebel because she chose to live in the most dangerous neighbourhood in Buenos Aires’. Predictably, her affinity for the neighbourhood does not extend to more than a couple of its residents: ‘I don’t want to hear the neighbourhood horror stories, which are all unthinkable and plausible at the same time and don’t scare me a bit’, she asserts. Her lack of fear is soon explained: ‘I realised […] how little I cared about people, how natural these desperate lives seemed to me’. In this case, plot contrives to make this one character care – she suffers nightmares that may be hallucinations or apparitions, hints of spectral presences that counter the children’s disappearances. But care is at the base of all these tales. As well as the fantastic and the historical, Enríquez tells of the depressingly mundane: the poverty, the rolling blackouts, the desperation of twenty-first century capitalism – all of which are anything but natural.